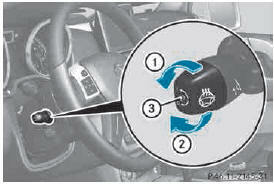 The steering-wheel heating heats the leather areas of the steering wheel. : make sure that the SmartKey is in position 1 or 2 in the ignition lock. ► Turn the catch in the direction of arrow 1. Indicator lamp 3 lights up. ► Turn the catch in the direction of arrow 2. Indicator lamp 3 goes out. The steering wheel heating does not switch off automatically. The steering wheel heating may switch off temporarily if: Rthe temperature in the vehicle interior is above 86 º F (30 º C) Rthe temperature of the steering wheel is above 95 º F (35 º C) Indicator lamp 3 remains on. The steering wheel heating is deactivated if you remove the SmartKey from the ignition lock. If steering wheel heating indicator lamp 3 is flashing, the steering wheel heating has switched off automatically. The vehicle's electrical system voltage is too low because too many electrical consumers are switched on. Once the battery is sufficiently charged, the steering wheel heating will switch back on automatically.